Just like there are four "cardinal winds" or directions of a compass, there are four cardinal rules of a private bullion weight standard. From an individual liberty point of view, the idea of a single global currency under one condition only, and that is if that currency turned out to be (1) nothing other than gold or silver bullion, (2) traded online or in physical form, (3) accounted for in actual, physical weight units only, and (4) not issued, regulated, or otherwise controlled by any human institution other than the free markets themselves. The reason for this requirement is that currency in any other form is too susceptible to fraud and manipulation by those who issue it. Because of the human fallibility issue, these concerns do not change when issuance is reduced to one single issuing entity, but are rather exacerbated by that fact. Fait money is an induced value currency. It depends on an official lie (it has "value" or "it's as good as gold") that must be backed up by official action (deception, manipulation) and virtually total media compliance with the official edict (the media must speak in unison as if the lie was truth). There currently exist online exchange networks for the transfer of legal ownership to physical precious metal bullion from buyers to sellers of goods and services. Physical coins could be exchanged in face-to-face transactions. Proxies should not be allowed because history has shown that they will sooner or later be substituted for the real thing and artificially inflated to no end. Even under a gold standard there were "proxies" for physical gold - the holder certificates redeemable for specie. Allowing for, and accepting, proxies led to the practice of fractional reserve banking. That, due to the human propensity to do "too much of a good thing" led to overprinting, i.e., monetary inflation. 3. Accounting in Physical Weight-Units Only. Calling a currency by whatever name that does not accurately state what the physical thing being exchanged or traded actually is brings with it a host of problems that open the currency up to abuse by issuing entities, be they governments, banks, or a combination of both. The counting of currency in "dollars," or whatever, under past gold standards was the original problem that led to all other ills mentioned above. Because people accounted and priced things in "dollars" instead of weight in specie, at first redeemable paper "dollars" became widely used and commonly accepted. From there, it was only a small step to taking currency completely off any redeemability in gold. After all, a dollar is a dollar, right? Murray Rothbard, one of the great classical economic thinkesr, has already observed that most if not all names for currency units were derived in one form or another from actual weight units in use at the time. ("What Has Government Done to Our Money?" by Murray N. Rothbard, 1980) http://www.mises.org/money/2s5.asp The problem is that no writer or policy maker at the time has ever recognized (or, if recognized, has never openly admitted) that this is a vital precondition to a sound, stable, and self-sustaining currency system. Modern governments depend for their very existence (at least in their present power and glory) on the ability to issue fiat and to borrow and spend far beyond their needs. Governments and their employers - the fiat bankers - would be the only natural enemies of such a system. Unfortunately, they are very powerful enemies. Governments can - and currently do - tax pure specie transactions out of existence, at least in theory. For example, in the United States, the IRS regards a sale-for-specie transaction as the legal equivalent of a sale of specie for currency, and only then a purchase with that theoretical currency of the item desired. The sale of specie for currency carries with it a potential capital gains-taxable event. If the fiat value of the specie was higher at the time of the transaction than when the buyer who wants to spend it acquired it, he has enjoyed a capital gain and could theoretically be taxed on that. This is a prime example of government sophistry and abuse of power. You and I know that no sale of specie for cash takes place whatsoever in this type of transaction, but the government claims the option of treating it as such and demanding payment of the tax. The US federal courts have upheld this idiocy. If a specie dual-pricing system was introduced by voluntary action of merchants and individuals here in the US, it could conceivably run up against this barrier. Government enforcement of this unwritten "law" (it is merely a view the IRS holds that has been affirmed by the courts) would entail a veritable administrative nightmare - but they may insist on it since their entire ability to finance expenditures by borrowing fiat from their central bank (which simply prints it, since it's only fiat) would be destroyed under a widespread adoption of a specie-weight standard. Without the ability to borrow and print what they need, governments would be forced to either extract all of their cash flow from their citizens via taxes, or turn exclusively to citizens and international investors for their borrowing needs. The latter means the interest it would have to offer to move investors to part with their bullion would have to be rather large - and that would bring long term interest rates far higher than they are currently and make borrowing far more expensive than it is for them now. That makes for angry citizens and would get politicians "unelected" very quickly, and it is why a fractional reserve fiat system enjoys so much government support in the first place. Government simply cannot allow this. It's a matter of self preservation for them. That is the political, practical downside of a bullion-weight standard. How can such a ‘specie-revolution' get started, then? That's where organizations or debating clubs like the Single Global Currency outfit can play a vital role. A crucial role, in fact. As the organization's membership and financial support grow over time, as it gains credibility with the public through the caliber of the experts and industry leaders who end up supporting it, its influence in shaping public opinion will grow. In thus shaping its view and its policies over time, this organization will also be forced to show its true face by virtue of the nature of the debate that takes place within its confines. Academicians want to prove to the world how brilliant and educated they are. A fiat system, because of its inherent instability, must be constantly "fine tuned" by human intervention in and interference with the normal flow of market operation. That requires academic input, and that tickles their egos. Since a bullion-weight standard is a largely self-regulating free market mechanism, little if any academic input is required (beyond maybe the need for demonstrating and explaining to an ignorant population the absolute need for such a currency). No wonder so many university professors give the idea of gold as currency a cold shoulder. If its members desire a global fiat system with all the attendant evils listed above, then so be it. At least then the world knows its true aims - and it now knows the alternative, or rather, that there even IS an alternative. Another potential downside of a global bullion standard is that the same technology that currently allows for instantaneous online transfers can be abused by governments imposing laws that require government oversight - and eventually control - of the digital currency industry. That way, governments can gain a sort of "back door entry" into the process by taking over what the free market has built, if that should come to pass, and then monopolizing the online transfer and exchange functions. A perfect excuse for this would be the claimed need to counter "terrorism" and "the drug trade" because of their needs for confidential transfers of currency. Once the bullion standard has achieved sufficient market penetration, governments could simply "step in" and take over the entire process. But that is only a "realpolitik" drawback. It is not something that makes the bullion standard conceptually or even practically inferior to a fiat standard. It is a feature that both systems have equally in common, and it simply points to the need of individuals in civil society to watch their governments carefully. Due to gold's recently implemented online transfer capabilities, it in no way lags behind fiat in utility, convenience, or ease of use - nor does it lag behind in security. On the other hand, bullion is far superior compared to fiat when it comes to preserving individual property rights, financial privacy, individual liberty, and the principle of honest weights and measures. Some may argue that there simply isn't enough gold in the world to cover the sheer size and quantity of worldwide commercial transactions and existing claims to currencies. But that is only a smokescreen. It is not a real concern because, under a bullion weight standard, gold would not be used to "back" currently outstanding fiat notes and claims. It would simply run as an alternative currency alongside the existing fiat system. Its use would start slowly, not even coming near to exhausting the capacity of gold at first. The free market (i.e., all the value-judgments of all market participants taken together) is very well capable of assigning an bullion-weight price to goods and services that balances the demand and supply of bullion with all of the goods and services available in the world. In fact, under free market conditions, such a balancing would be automatic and most efficient - if allowed to take its course. At first, this bullion weight price will have a somewhat stronger association to the currently managed fiat-price of bullion. People would exchange fiat for bullion at whatever goes for the current "market price" - however rigged that price may ultimately show itself to be. As time goes on and as its use becomes more widespread (especially as the dual pricing system becomes ubiquitous and as employers slowly begin to pay their employees for their labors in specie), people will focus their attention on the specie-price of things, rather than the fiat price. A bullion currency accounted for in physical weight units completely obviates the need for "exchanges." As this happens, the common focus will shift from looking at gold in terms of "how much fiat you can get for it" to looking at fiat in terms of how much gold you can get for it. In other words, what will matter will no longer be the fiat price of gold, but the gold-price of fiat, or how much fiat it takes to buy a quantity of gold. Put still another way, people will realize that it takes less and less gold to buy fiat. Fiat will become ever cheaper in gold terms. Bottom line: Gold or silver will become the foundation of our value perceptions again, instead of fiat. At current fiat-bullion prices, a decent bottle of wine will cost about one gram of gold. A compact sized car will cost "a kilo" or one thousand grams, etc. Over time, as double-pricing becomes more wide spread, and as more people earn bullion instead of fiat, current paper-driven exchange pricing mechanisms like the COMEX will lose their usefulness. As gold weight becomes the standard for economic value judgments, nobody will care anymore how much fiat an ounce of gold "costs." People will instead realize how much less gold it takes to buy a given quantity of fiat over time. They will witness first hand, every day, the rising fiat prices of items they buy at the supermarket, while the bullion-weight price of the same thing remains stable. Merchants will want to be able to buy future inventory at stable gold prices rather than increasing fiat prices, knowing that they will earn less and less fiat over time with which to pay the constantly inflating prices. In order to get more customers to pay with gold rather than fiat, merchants have an incentive to offer better deals in terms of gold weight, so customers benefit from an increase in their gold's buying power. The level of the "money supply" (i.e., specie supply) in a given country's economy will depend on how much it can procure in trade with other countries. On the other hand, many nations that are currently considered "poor" could become quite wealthy because of their large natural gold deposits (i.e., African nations). That will go a long way toward equalizing them with the rest of the world. Many an economist will argue that, since gold cannot be lent into existence and its natural supply is therefore limited, going to a pure gold or other specie weight standard will impoverish nations and shrink the world economy because less "money" will be available to create the same kind of "wealth-effect" that current fiat proliferation has effected. Arguing that would be the same thing as claiming that inflation is "good" because it makes stuff you own more expensive and you therefore "richer." Sure. It makes things you own "cost more" but at the same time decreases the buying power of the currency you will get for it. That would be a nonsensical argument - but that doesn't keep a good many learned economists and financial analysts from making it. Of course banks, as they are currently constituted, would go broke under such a system. Their only way to "make money" is exactly that: Making (creating) money.- out of nowhere, that is. They loan it into existence and create a credit on your account and a corresponding receivable on their books. As you pay your loans back these receivables are slowly extinguished - but the banks get to keep the interest they charge you for fabricating making "money" out of thin air. Under a bullion standard, this is impossible. Gold cannot be "lent" into existence. It can be loaned only by actually taking some of what you have in your possession and giving it to the borrower for his use until he returns it to you. Banks currently pay you interest for money you deposit with them because they can loan it out to other borrowers and make even more interest on it, pocketing the difference. If you deposit gold with a bank under a bullion weight standard, you an of course allow the bank to loan it to someone else and the bank can pay you interest on it - but what if you want to draw your gold out before the bank's other borrower returns it? The bank could only give you your gold if it had the right to take someone else's gold and give it to you until yours is returned by the borrower. But the bank must then pay the other depositor whose gold it gives to you interest for allowing the bank to let you have it. However, it was your gold that you deposited, so you shouldn't be charged interest for taking it or a like quantity out of the bank. This sort of situation requires a fractional reserve banking system where all funds on deposit with the bank are commingled and become the bank's legal property while you only retain a paper claim to a like quantity of gold as that which you deposited. Under the new global bullion standard there will be no fractional reserve banking, though, at least not when it comes to bullion deposits. That's the kind of dilemma banks will encounter under a bullion weight standard without fractional reserve banking. You know they will fight tooth and nail to keep anything like this from happening. On the other hand, given the huge advantages a bullion weight system provides individuals and organization in terms of currency stability, a good argument can be made that governments should force the banks to incur that detriment because it's good for public policy (i.e., good for you and me). Don't be surprised, though, if governments come down on the side of banks in this dispute, no matter how good the bullion weight standard is for you and other individuals - the people who voted the politicians into office. The fact that politicians will inevitably side with the banks - who didn't elect them and to whom they have no fiduciary duty - tells you who politicians are really working for. That is not surprising because banks and large financial institutions are where government currently draws it's needs for filling top-level cabinet appointments. It's also not surprising because central banks are nothing but private banks with a special charter, and central banks are how governments fill their needs for borrowed funds - funds they cannot make up with tax receipts. So, the choice of what kind of global currency system you choose - whether fiat or bullion - determines whether you want less government (synonymous with truly free markets and individual liberty) - or total government, also known as tyranny. If allowed to exist on a global scale, such a system will engender a degree of tyranny unlike anything the world has ever seen - in all of history. Be careful what you choose. Very careful. Political considerations cannot be separated from economic and financial ones when you are talking about implementing a single global currency system. The number one negative consequence of a government issued fiat currency is a government's (every government's) propensity to over spend. That, in turn, leads to temptations to over-borrow and over-issue. There is no amount or manner of "oversight", whether by a legislative committee, by voters, by "watchdog groups," or whatever, that could ever hope to adequately mitigate this danger. The transfer of all the powers of currency issuance to one global entity would entail a concentration of power that could only be supported by an equal concentration of political power. In short, world government. Once all of the monetary powers of every country are transferred to the centralized authority, there would be no checks and balances, no power of nullification, which could guarantee that those powers would not be abused. Human nature, in turn, guarantees that they will be abused. On the other hand, if a global bullion-weight standard was ever achieved, or even if it was achieved only inside the United States as the major power on earth, once people can see for themselves (without having to follow some arcane academic discussion about money) what the advantages of a 100% bullion currency system are, and once the concept of bullion-weight pricing becomes firmly entrenched in everyday usage, watch some government try and come along to say that its printed paper is the equivalent to the physical gold that individuals exchange and save. Can you imagine accepting a piece of paper that claims to be "one ounce of gold"?? Paper can easily claim it is a "dollar" because a dollar is a metaphysical concept that no one relates to anything tangible - despite its history of once having been exactly that: a physical weight unit. No one, regardless of his or her educational level or intelligence, can be deceived about what an ounce, gram, or whatever of gold is - and what is not. Therefore a bullion-weight standard, once established in the minds of the population at large, is the single most effective bulwark against future official subversion and debauchement of the monetary unit. With governments and banks out of the way in messing with the very measuring stick people use to gauge commercial transaction and wealth positions, a global level playing field among trading nations would be guaranteed. Currency risk, exchange risk and expenses, debauchement, and the ability of one nation or currency area to destabilize the world system by unilateral action would be things of the past. Governments would be smaller. Their ability to over-borrow, overspend and wage wars on others would be extremely curtailed. Central banks would no longer be able to control governments by being their ultimate (and endless) money source. To individuals, a bullion coin in their hand would be worth infinitely more than two (fiat units) in the bush. All in all, a worldwide bullion-weight standard would sport all the advantages of a global single fiat unit - but without any of the drawbacks. It's something worth considering. In this multi-decade gold bull market, the old investment maxim of "know when to buy and when to sell" has been replaced by "know when NOT to sell!" 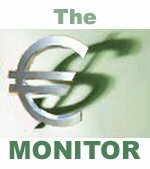 Euro vs. Dollar & Gold Monitor subscribers know when not to sell.